They show variations in flood stage over time as a river channel is cut deeper in into the bottom layer. If the total volume of flood water is roughly the same each year, and the rate of cutting is fairly fast, then over time the channel will be cut to a depth that the "flood stage" can no longer reach. The old "flood stage" will look like an abandoned step left at the side(s) of the river. Created when a steep stream runs out on to a nearly flat plane. The velocity loss requires sediment to be dropped, as it builds it forces the stream into new channels left and right to move past the dropped material. Over time the left and right movement disperse the sediment into a fan shaped structure on the plane. (It is fundamentally similar to a "delta", but on the land's surface. The deposit that forms when a stream runs into standing water. Similar in shape to an alluvial fan. 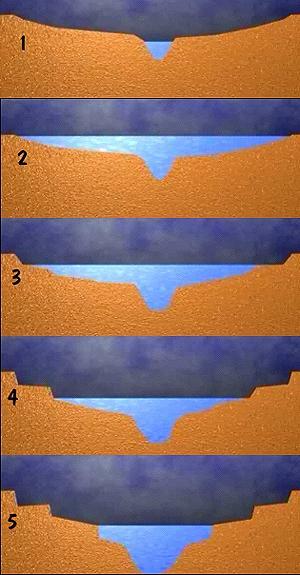 The normal delta forms when a stream empties into the ocean. A braided delta occurs when a braided stream flows into standing water. Like the formation of the braided stream itself, a braided delta forms when the flow is highly variable, and from a steep source. Where there are very large rivers, the Nile, the Amazon, the Mississippi, and the Ganges, the delta formed is very large and rich in soil from the middle of the associated continent. The deltas may grow to such size that they produce rich but wet farmland.